Tomorrow is the start of the summit and I have received some comments and questions about the process, so I thought that this would be a good place to answer them all. If you can think of any that aren't on this list, shoot me an email at erinsinsidejob@gmail.com or leave a comment below and I will get back to you ASAP! 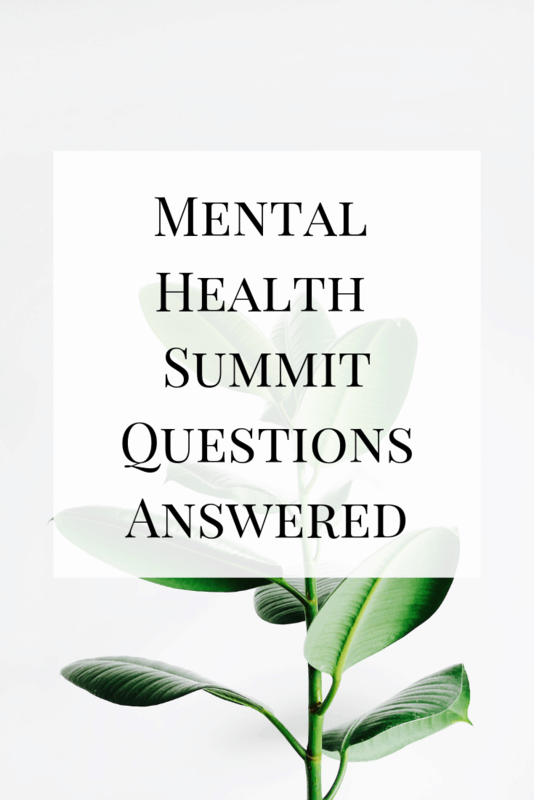 The 2019 Virtual Mental Health Summit is a 3-day online event where you can learn from experts about mental health issues, techniques for coping, and how to transform your life for the better. It sounds so simple when summarized that way, but it’s 15 sessions of incredible information and personal reflections on how to live your best life no matter what you have going on at any given time. It runs from April 9-11 and is FREE for everyone to attend. Sessions are uploaded online for you to watch at your convenience, so if there’s one you want to see, but you’re unable to make that time slot, you can watch it later! Take a look at the list below and hopefully it will clear up any questions you may have! Most of the answers to questions you may have are on the main registration page, and this is also where you can find a list of session topics, speakers, and times. Check to see what topics are being covered to see if there's anything that speaks to you. 2. What if I can't attend during the specified session time? This is a question I've gotten a lot. Most of the sessions are in the middle of the day (9 am - 1 pm CST) and I understand that many of you work a 9-5 (or similar) job. Because of that, each session will be live to watch for 24 hours from when it ends (so technically 25 hours from when it starts). This means that even though you may be at work when a session goes live, you still have 24 hours to watch it. Make some time after work to do something beneficial for your mindset and well-being by watching a session or two (or five!). 3. What if I don't live in Chicago? The perfect part of it is that this is an online, virtual summit, meaning that as long as you have internet access, you can watch from anywhere in the world. 4. Can I only watch the sessions once? Nope, they are up and available to view as many times as you want for a 24 hour period from when they go live! 5. How do I get to the sessions? Once you register (FO FREE), you will receive a welcome email explaining the process. You will also receive an email each morning of the summit that tells you what sessions are scheduled for that day and a link to the main sessions page so you can choose which ones to listen to and when. 6. What if I want to watch the videos after the 24 hour period? Unfortunately, the sessions will be taken down after the 24 hour period for free viewing. Fortunately, you have the opportunity to purchase an All Access Pass if you want to have access to them at any point, missed them and want to watch them, or you just want a bunch of extra goodies! 7. Why would I buy the All Access Pass if I can watch everything for free? For some, that's totally fine! The AAP simply gives you access to all the sessions plus bonus extras so that you can watch or listen to them at any time. For some people, this is ideal because they may have connected to a certain session or sessions and want to be able to refer to them further down the road. To put it in perspective, a single hour of therapy can sometimes cost nearly $250. Eight hours of sessions would be $2,000 and you'd experience each session once. You can have lifetime access to over 8 hours of sessions with experts and more resources for far less. It's completely up to you if you want to purchase it (no pressure! ), but as a reminder, it is 50% (that's $100) off until tonight and then price will increase as the summit wraps up. 8. What does the All Access Pass include? Everything is bundled up nicely in one place and is laid out in the list below. You can read more and decide if it's for you on the All Access Pass page. I hope you can find some time to attend since it's a cause that's very near and dear to my heart. It's so incredibly important to talk and educate ourselves about these things and I know that there is at least one session (but prob more) that will speak to each one of you. Take a couple minutes to check out the main registration page and see if this is something you might find beneficial. Remember, it's FREE and doesn't hurt to just sign up so you can get the info on the days when the sessions are live, even if you can't attend them all. I hope to see you all there starting tomorrow!